"Chess that's not really that 4X, but it is a lot more 4X than normal chess." Your favorite characters from the international smash hit Chess are back! You can make new pieces and choose your army composition! "E'pawn'omy" - An economy based around pawns. Which all have huge effects on the game that encourage wildly different styles of play, so finding the right mix is pretty tough. 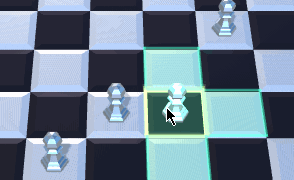 Then I'm also considering some other things, like resource tiles and what a Queen is worth - currently the only way to get a queen is to spawn one from the debug menu. Some of these options might be in game, but I want to be careful that players can't accidentally create a game that isn't fun. No, it's really not. It may or may not get more 4X-y as I iron out the gameplay kinks. 4X stands for 'Explore, Expand, Exploit, Exterminate' and I really only have 'Exterminate' covered. Maybe 'Expand', if you're being generous. What I'm really saying is: "This game needs a better name." Initially, the idea was a tactics-style game where each unit had their own movement pattern and different attacks had different patterns as well. This never made it to a prototype, since just thinking about remembering those movements well enough to play it well sounds exhausting. But then it occurred to me that if I stuck with the movement patterns from Chess that everyone knew, remembering those patterns became a lot more feasible. Separately, I became really interested in the idea of a deterministic 4X game. 4X games are so married to chance that it sounds a little odd, but I think it's possible. I was thinking that maybe if moving units had significant complexity it might work. Those ideas smashed together like particles in a supercollider and I realized that Chess with an economy might be pretty neat. I think there's a really good game in here somewhere, but it's tough to find the right mix of elements. My next job is making a rudimentary 'New Game' UI that will probably expose all of my options for the time being. Then I'll be able to put up a web build for people to play and hopefully weigh in on what options make for the best experience. Then, I'll probably go ahead and work on getting online multiplayer in since that will make testing the game a lot more fun. Thanks for reading. Here's the game on a stupid big board. 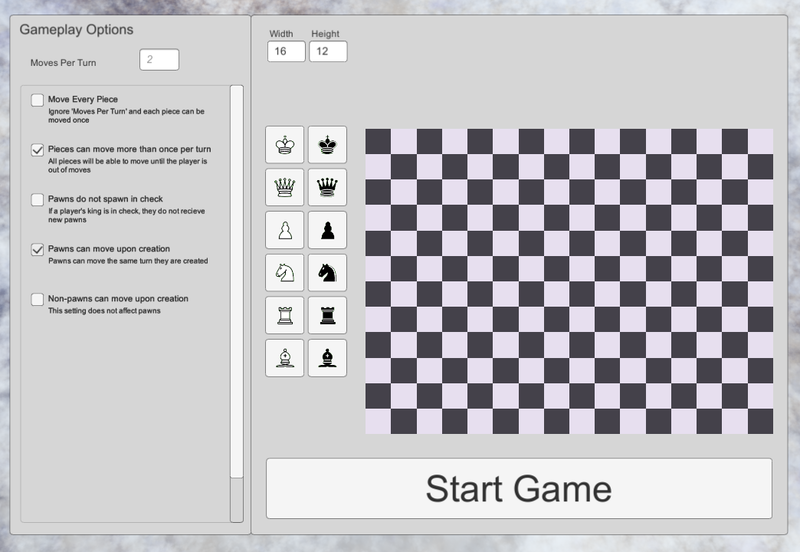 I am interested in any variation of chess, which recently I had the chance to try some on mobile. Your project is very interesting, congrats! The E'pawn'nomy alone is enough to make it really interesting. For eXploration, maybe have the board extend in various directions and/or have special tiles that you want to take control of? (e.g. a spawning tile which would work only if you had your king next to it)? I know it'd be essentially making it closer to a 2d tiled game... but I guess it'd bring more X to your 4X. I'm a web developer so I spend a lot of time with frameworks like React or Vue. These facilitate making data-driven sites where what the user sees is adapted from a 'state' - information held about a user or what they're doing - and a back-end store of data. The pattern is valuable because it allows for a ton of re-usability even in wildly different visual contexts. Because many games are very much driven by the view, this design pattern doesn't seem to be talked about much in game development. It's definitely used - for dialogue, inventories, etc. 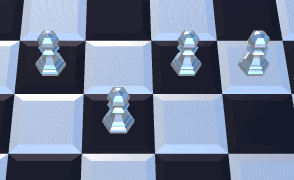 But I remember learning about this pattern for the first time and it opening my eyes to some new possibilities, so I thought it might be good to talk about how I'm using it in Chess4X. Tiles simply store a boolean value (true or false) of whether they exist, because the game fully supports 'missing' tiles. And because this window is data-driven as well, I can add new gameplay options and they will pop up in the list for me 'all by themselves' instead of having to place each one by hand. Speaking of, can anyone recommend any of the Unity HTML/CSS UI assets? I wanted to get a handle on Unity's UI first, but writing in HTML would be so much better. But my game's state isn't so simple! This is probably true of most games, Chess 4X has an extremely simple state. But even if the pattern doesn't make sense for your game at large, it's worth thinking about how applying it to some of your systems could save you time and effort. Or how recording some subset of your game's state could help you debug and analyze it from different perspectives. 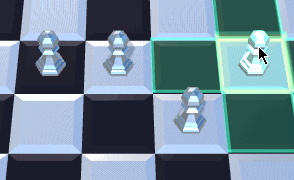 Loading a board from a previous move may let you move pieces that shouldn't be able to. "Move Every Piece" option simply sets your moves to 100 instead of doing something smart. You will have to end your turn yourself if this option is enabled. The camera has no limits. You can zoom through the board or scroll out to see how I made the clouds or go left forever. You can make stupid starting positions. However, you can't start a game unless each player has a king. But the game will not warn you. Sorry about that. Thanks! The E'pawn'omy is working well and seems pretty fun. I had considered special tiles that give you bonuses if you have pieces on them. One grants an extra pawn every turn like you described and then one that grants an extra move every turn. Maybe one where if you manage to keep a single piece on it for several turns it pops out a queen? Unsure. The game actually supports boards with holes in it, and I considered 'high ground' tiles as well - where pieces could attack down them but not up. Mostly, I've played it at the traditional chess board size (8x8) because it makes for a quick confrontation which lets me check rules faster. I am actually very interested in the version of the game with more moves per turn (and starting pieces?) on a larger board, but only if it plays well. eXplore/eXploit is hard for you I guess. I had a very vague fog of war and resources that you collected depending on what the ground type was where your units ended their turn. That area turned grey when you'd collected X amount of resources from it and was considered barren from then. The idea was to use these resources to upgrade between games, but I don't think this would work for you. Anyway, I hope that gets some ideas going for you!